We're a bunch of friends who love style and bike riding. We think it'd be fun if these two things spent more quality time together. 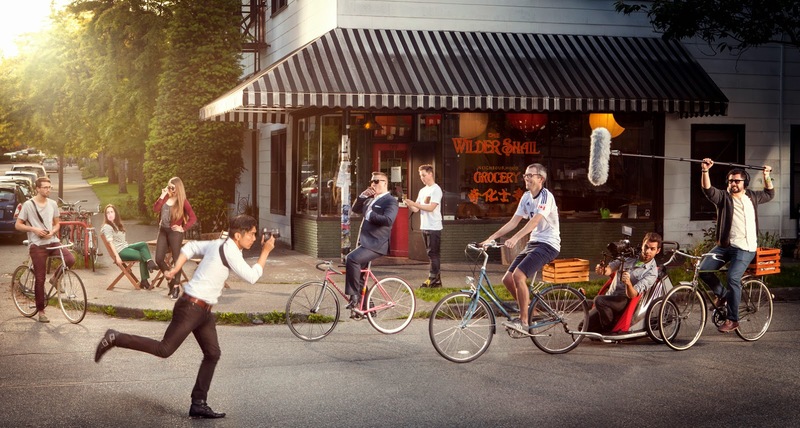 Founded by David Phu, Vancouver Cycle Chic began as a photo blog in 2010, documenting Vancouver's stylish people on bikes. The team registered as a society in 2012. It's also part of the Cycle Chic Republic — a group of blogs around the world that began with Copenhagen Cycle Chic. After a lot of positive feedback about the blog, we decided to try our hand at other stuff, like events and films. Check us out. We imagine a Vancouver where stylish people on bikes are commonplace. (Think Copenhagen, Paris, New York, Tokyo, Montreal, Portland.) Where people are comfortable on bikes.Where bicycles help us express our personal style and connect with our neighbourhoods. We have a hunch that, although Gore-Tex is great for commuting in the rain, there's more to cycling in our city. Getting on a bike can also be super casual, fun, and social. You don't need to be a "cyclist" to do it. Just hop on and go. Whatever. We would love to see you riding a bike, is all. And looking damn fine while you're at it. Great site! And love the photos! Buuuuuut what's with the no helmets? I have an awesome bike (1970's dark green Phillips) and I like looking good on it but I also don't want brain damage. I've know many people who've been hit by cars in this city and have had their noggins saved by their helmets. I know they're not "chic" and most of the time look downright dorky, but it might be something you should consider promoting especially because in Vancouver, by law, you have to wear a helmet while on a bike. Fantastic site! Everyone looks so beautiful in the pictures. This is EXACTLY why I love riding in this city! Thank you so much for the feedback. It really means a lot to us! We work really hard to capture the beauty in biking. Hey there! Do you guys do photoshoots and or video projects? I'm a student at a local secondary school and I have been asked to produce a video that promotes biking to school. I was wondering if you guys are interested in helping? Is there an email that you can be reached at? Copyright © 2014 Vancouver Cycle Chic Society. Powered by Blogger. This site inspired by and created with permission of the original Copenhagen Cycle Chic. Photos on this site may be reused by emailing us for permission. All photos must be properly credited--it's just plain right.